"Asterix and the Extraterrestrials" – "Asterix et Extraterrestres" in the universal language of the year 50 B.C. –, this is the name of the team that fans of the gaulish comic hero Asterix founded to participate in the SETI@home project of the University of California in Berkeley. With the motto "Asterix searching for the little green men" our team searches out extraterrestrial life. The SETI@home project uses the idle time of millions of computers in the whole wide world to process data recorded at the Arecibo Radio Telescope in Puerto Rico to discover signals from an extraterrestrial civilization. Every Asterix fan who is interested in the search for the extraterrestrials (and of course anybody else... ;-) ) may join our group. Have a look at the SETI@home project homepage to get more information about the download and installation of the SETI@home client and about the joining to a group. 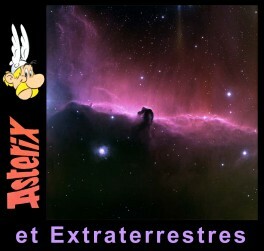 The banner on this site shows apart from the little gaulish hero Asterix the Horsehead nebula, a formation in the constellation of Orion, the Hunter. The image was taken at Kitt Peak National Observatory, Tuscon, Arizona.